Shrubs in a Tree Bed? My neighbor wants to plant some small shrubs in our tree bed. Is this a good idea? Probably not. In general, gardening in your tree bed is a good move. Not only will it beautify your block, it’ll help remind pet walkers and other pedestrians that this a spot to grow living plants, not a trashcan or proverbial fire hydrant. But you’ll want to choose plants that won’t compete with the tree for water. Flowers or groundcovers with shallow root systems are your best bet. Good options include spring bulbs like snowdrops, crocuses, and miniature daffodils (which are shunned by squirrels rooting for food), small annuals with shallow roots like zinnias and impatiens, and perennial groundcovers like bugleweed or stonecrop. When you do plant them, use a hand cultivator to gently loosen the top inch or two of soil without damaging tree roots, which are often quite close to the surface. 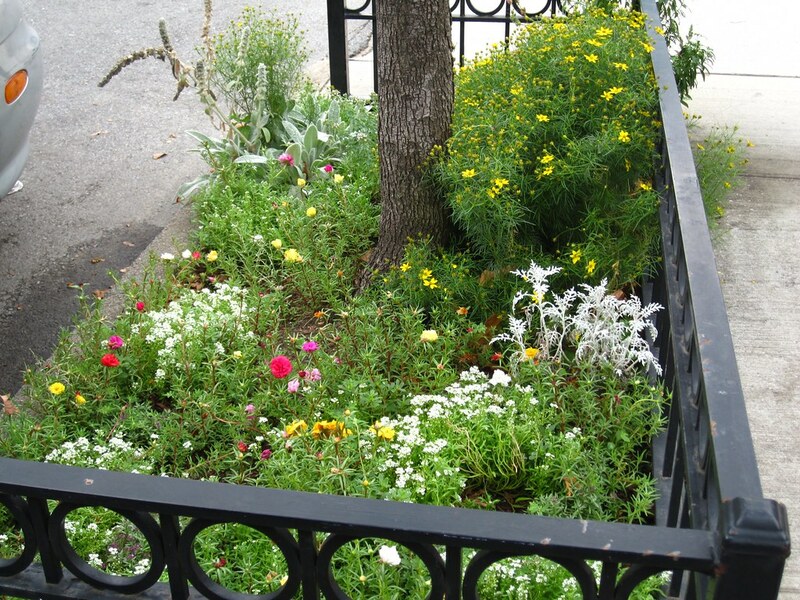 For additional plant choices, see A New Tree Bed Garden. To learn more about street tree care, read Caring for City Street Trees. flowering. Do you know why they haven’t turned their usual color? A drought tolerant tree pit planting beats the heat and looks great.